The Ceramic Matrix Composites Market is experiencing high technological innovations through constant research and development done by the companies manufacturing ceramic matrix. The market is undergoing intense competition due to changing technologies and evolving trends, as analyzed by Transparency Market Research (TMR). The key contenders in the market are focusing on providing high comfort, with robust structures, and improved performance that can be used in thermal management, high-end sports equipment, and in electronics. Some of the key players analyzed in report are CoorsTek, Specialty Materials, Inc., Clariant Corporation (KiON Corporation), Ultramet, Ceram Tec, COI Ceramics, Lancer Systems, LP, and Clariant Corporation (KiON Corporation). As per the TMR report, the valuation of the ceramic matrix composites market could reach up to US$ 6.5 bn by the end of the forecast period. The ceramic matrix composites market can expand at 8.1% of CAGR during the forecast period from 2017 to 2026. SiC/SiC segment, a product type is estimated to lead the share in the global market due to higher oxidation resistance than others. According to the regional analysis, Asia Pacific excluding Japan (APEJ) is projected to lead the market as a reason for developing aerospace manufacturing and increasing demand for energy in this region. Low cost and high labor supply in various countries such as China, Malaysia, and Thailand in this region have also triggered its demand in APEJ. Emerging economies are presenting huge growth opportunities that will largely benefit the ceramic matrix composites market in coming years. Manufacturing sector plays a crucial part in ceramic matrix composites market, whereas marketing and supply chain management activities have the significant amount of the revenue that have been produced by the market players. The upcoming players with a potential financial backup have higher advantage in getting through the market and making their own place by competing with other players. Additionally, the dominant companies take over the business intelligence units that assemble valuable and complete knowledge about the consumer’s point of view depending on their activities and experience from time to time. The high cost is involved in making energy intensive procedures while using ceramic matrix composites. Despite of high cost the high-end applications, which includes thermal management, defense, and aerospace; have created lucrative demand for ceramic matrix composites. Ceramic fibers, produced in demand-specific quantities, do not impart benefits of mass production. 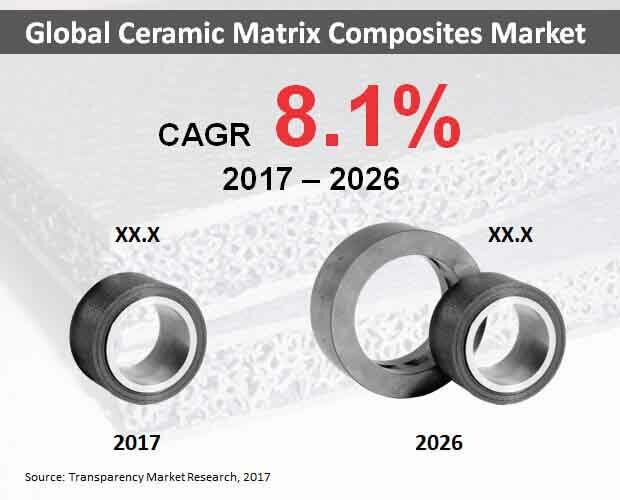 However, developments in mining technologies and metal joining are expected to boost the demand for ceramic matrix composites market during the forecast period. As in the conversion procedures includes ceramic matrix composite manufacturing that involves high energy consumption. Thus, forcing technology providers to make effective in developing newer energy efficient manufacturing procedures. Moreover, developing nations are providing appropriate initiatives for research and development with the help of public private partnership and through joint ventures.